holding on so long the days roll on….. YET, WE ARE KINGS AND QUEENS. Tshegofatso Sebitloane better known as “Maikutlo” is a singer, writer and poet from the capital city of the North West in Mafikeng. Poetry and word expression has been and is still a large part of her life. Maikutlo started exploring her passion for poetry and word expression six years ago through the talent development and nurturing programme called Expressions under Lyv Promotions created by Tolamoetlile Kgobokoe aimed at nurturing up and coming artists from all art disciplines. This platform launched her artistic career. 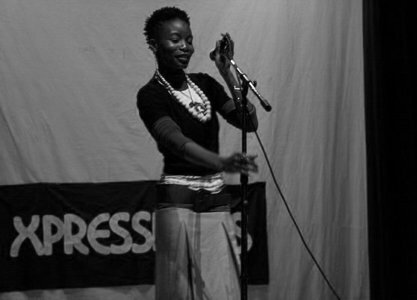 * In 2007 she worked on Nite of Words – Blood Love which was a Poetry Showcase which went to Grahamstown Arts Festival and later showcased in Mmabana theatre in Mafikeng. The production directed by Modise Ngwato had fresh dose of poetry, comprising of music and writing skills. * 2010- Performed at the 30th celebration of the North West University Gala dinner with special guests like the Rector Professor Dan Kgwadi and the Alumni of the University from previous years. * 4 December 2011- took part as one of the performers in the Art resolve weekend sharing the stage with live performances by Molemi, Quincy K, Kgafela oa Magogodi and Marabele, Mpho ya Badimo former radio presenter of the reggae Show- Moribo wa Raggae. * Currently holds the position of vice chairperson of a poetry Group based in the North West University Campus by the name of 5th Groove.